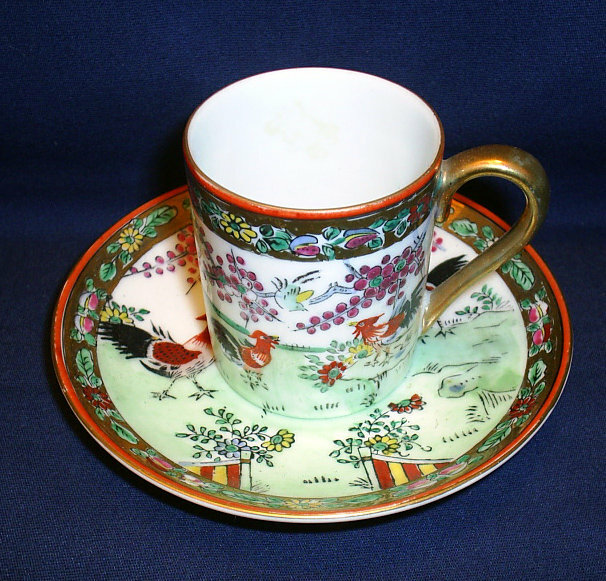 I've seen a number of Japanese cup and saucer sets in this style, but this is the first set I've seen with roosters on it. 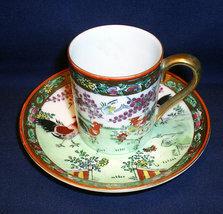 It's a really cute set, with three roosters on the cup and two on the My guess from the markings is that this set dates from the late 1950s to 1960s, but that's a guess--don't hold my feet to the fire on it. The saucer is 4 5/8 inches across. The cup is 2 inches across and 2 1/4 inches high. I've run my fingers over it very carefully and I can't find any nicks, chips, or damage on it. The gold shows some very slight wear, but overall is in very good condition. Please keep in mind that I am not an expert on anything. I am describing this as I see it, and giving the best evaluation of its condition that I can. I always try to describe accurately any imperfections that might affect the value of the piece, so you can bid accordingly; inspect the photographs closely for additional information. E-mail me with any questions prior to bidding; I usually respond within a few hours to questions. SHIPPING AND HANDLING CHARGES: I am very much aware that shipping costs have risen dramatically over the past year and a half. I charge NO HANDLING FEES. The shipping cost you see for any item is exactly what it costs me to pack and ship it. As a small shipper, I donaÂÂt have the luxury of contract shipping rates or volume discounts on shipping supplies, so my rates do tend to be a little higher than those of larger shippersaÂÂ. Please be assured that I am doing everything I can to keep shipping costs as low as I possibly can. I'm happy to combine shipping whenever I can do so safely. When I combine items, I look for the best possible rate. The weight of this cup saucer is 5 ounces. The shipping rate is 4.00 for First Class, and is good for the continental US and some locations in Alaska and Hawaii. For Alaska, Hawaii, or international shipment, please contact me to confirm shipping rates. To help keep costs down, I am no longer making insurance mandatory on fragile items; it is now "buyer's choice." However, if you decline insurance and something gets broken in transit, you assume all responsibility for it. I pack well, but I can't control what the Post Office does after the package leaves my hands.